Convert JPE to JPEG2000 automatically. 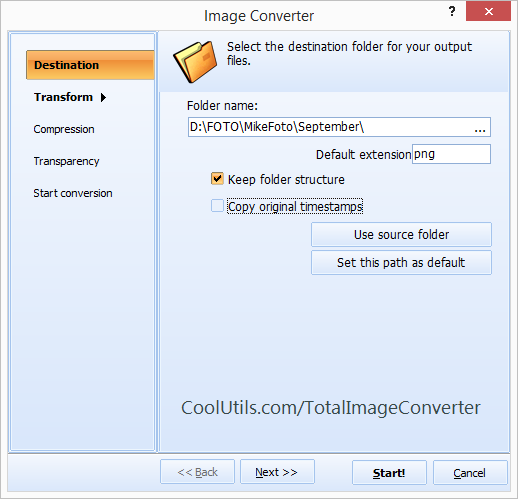 You are here: CoolUtils > Total Image Converter > Convert JPE to JPEG2000 automatically. This image converter changes the whole idea of file conversion. It features batch function, which allows you to manage as many files at once as you with. Besides, it has an array of editing options, so you can preview and shape your pictures as you see fit prior to conversion. This converter supports a variety of formats. Particularly, you can convert JPE to JPEG 2000 any time. All you need to do is know where your JPE images are located and how many of them you wish to convert in one go. Once you launch the interface, you can simply read it and be aware of every following action. 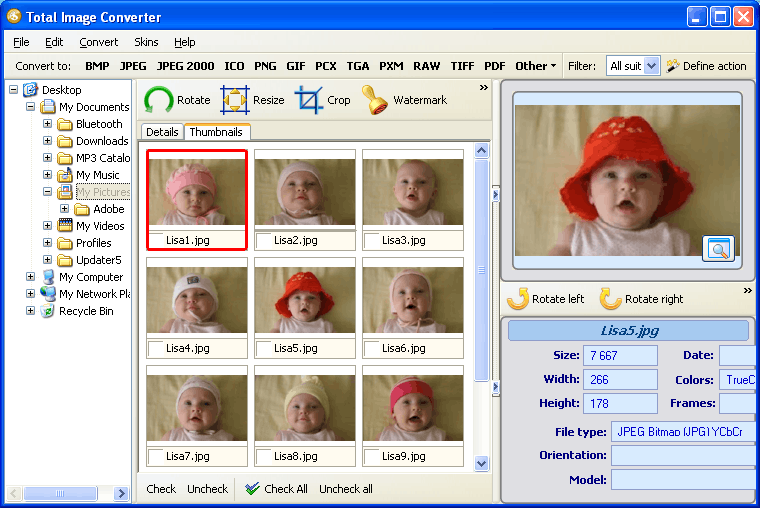 This converter features command line, batch mode, a number of editing options and a built-in image viewer. Run the interface and use the folder tree in the left-hand panel. Find the folder with JPE images. Click it and view the list of images. You can choose either thumbnails or details display mode according to your preferences. Check the images, which you are going to convert. If you are converting one or several images, tick them manually. In order to convert JPE to JPEG2000 in batch, you should click Check all button located at the bottom of the interface. All the images will be ticked automatically. Apply rotate, resize, crop and watermark options and view the changes in the built-in viewer. Select JPEG2000 in Convert menu or in the Format toolbar. Use the wizard to adjust conversion settings. You may choose not to change the settings and leave the default settings, which are quite optimal. Select destination folder, so that you can find your JPEG2000 images easily. Click Start to launch conversion. Wait until the program completes the work. This batch JPE converter is a shareware program, which can be purchased online. Buy it right now or download the 30-day demo version first. Check all the advanced options and functions and make your own opinion. Do not be shy to share it with us. Make your suggestions and leave your feedback. Convert BPG to JPEG like a Pro! Convert PSD files to JPEG 2000 with ease! Convert TIFF files to JPEG 2000 with ease! Convert WebP to JPEG in batch. Convert ORF to JPEG2000 easily! How to convert EMF to JPEG images in batch? How to convert PNG to JPEG2000? Convert JPE to ICO automatically. How to convert JPEG to ICO in batches? 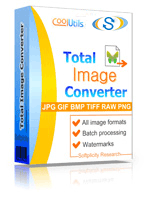 How to convert JPEG to TGA in batches? How to convert JPEG to PS in batches? How to convert JPEG to PCX in batches? How to convert JPEG to TIFF in batches? Why convert PCD to JPEG in batches? 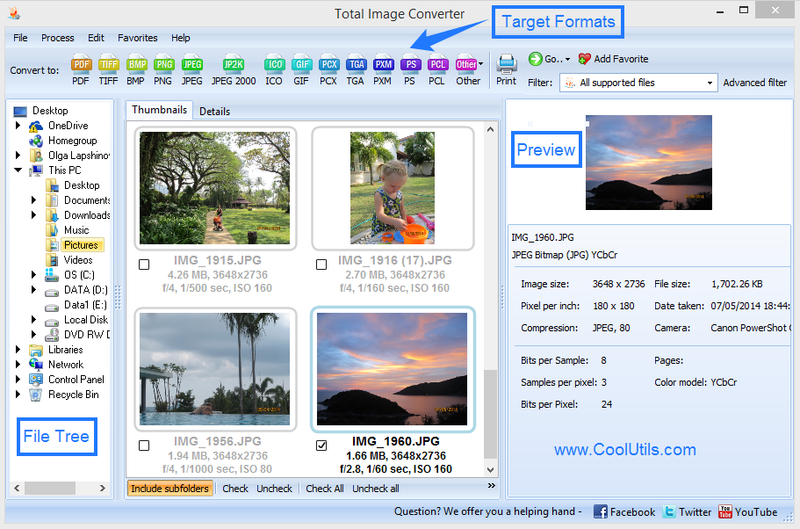 Converting PSD to JPEG in batches just in few clicks! Convert PCD documents to JPEG with ease.